This page contains all the information available for Oddish in Pokemon Ultra Sun and Moon including the moves learnt by level up, egg moves and TM moves. Run Away Except for trainer battles, can always run from battle. It still cannot switch during Mean Look or Block or when the opponent is trapping with the Arena Trap, Magnet Pull, or Shadow Tag ability. 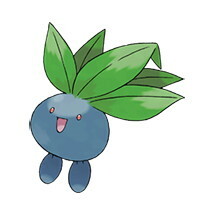 Gloom doesn’t evolve to Vileplume using a Moon Stone, it uses a Grass Stone.